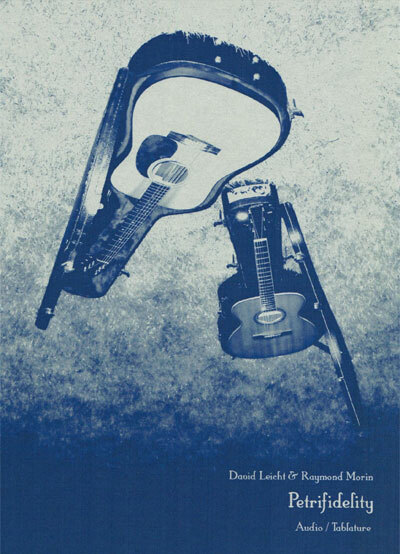 My good friend David Leicht and I are proud to announce Petrifidelity, our new recording of original duets for acoustic guitar. Over the last couple of years, we’ve been composing more and more guitar instrumentals, and we thought it would be a fun challenge to create a package that contained not only the audio for these new songs, but tablature (a system of musical notation, specific to guitar) for each piece. We were inspired by the old Kicking Mule and Shanachie LPs, many of which came with detailed, hand-lettered tab. These records and their accompanying notation were invaluable in my learning fingerstyle guitar, and David and I were both excited to contribute to that tradition. I carefully designed everything about this package myself. The book is 16 pages, and features tab for each of the 6 songs. 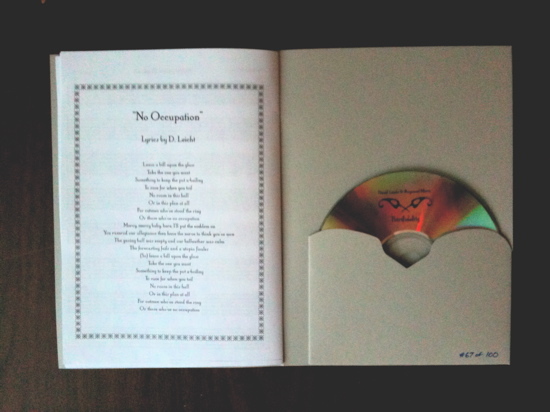 The covers were printed on grey Folia cover stock, and the CD pockets were hand-cut. Each book was scored, glued, folded and stapled by hand. Each players’ parts are represented, with David’s appearing on the left and mine on the right. Lyrics are also included for “No Occupation,” the lone vocal song in the set. The notation is pretty straightforward, but we’ve also included a legend that defines some of the symbols that appear throughout the book. I’m no guitar instructor, but in terms of difficulty, I would guess that these pieces qualify as “intermediate” for guitarists familiar with fingerstyle playing. 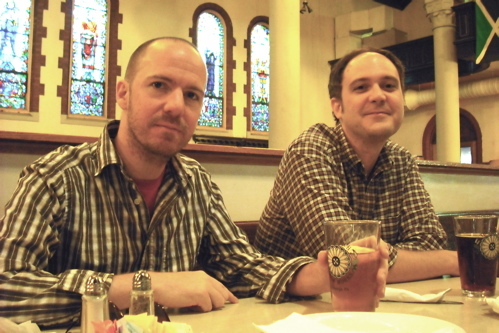 Thanks for reading Work & Worry, and thanks for checking out Petrifidelity. Please enjoy this stream of “The D. Putnam Strut”, the lead track from the CD. This is a really sweet piece. You can justly be proud. Nice work guys! I just found about your project via mutual friend chuck johnson. Great concept, great results.